Update, CPU and GPU temps are identical as when LM was originally applied. Nvidia GTX 1080Ti @ 2100 Mhz - Everything fully watercooled with a phobya xtreme 1260 radiator! Nice temps but I think it's too risky. Do any EVGA officials browse this forum? But in all seriousness I highly recommend that you DO NOT use liquid metal for cooling. The cost of voiding the warranty and buying a new GPU is not worth a few degrees. It's much cheaper to buy a Hybrid cooler and your temperatures will be much better! I'm sorry but all the people saying that "it's too risky to use LM" just dont know how to use it properly. The only way you can fry your GPU is if some LM is spilled near the small components near the GPU die when the computer is turned on. 2°) apply the smallest amout of LM as possible to ensure that there is not enough to leak outside the GPU die. If you do these 2 steps carefully it's impossible that LM get in contact of the small components near the GPU die so it's impossible to fry the GPU. Hybrid coolers get 55°C full load temps at best, with a custom watercooling and LM you get 30°C at full load. It's not just "a few degrees", it's a huge gap! We do understand but not worth the risk. No such thing as impossible as accidents happen all the time. To each their own at the end of the day. I believe my 1080ti ftw3 elite card only hit 32-35c full load at 2190mhz while bench or gaming. I call that good enough with full custom loop. GTXJackBauerWe do understand but not worth the risk. No such thing as impossible as accidents happen all the time. It's ironic coming from someone who has a custom built watercooling where water could spill on your hardware and destroy everything seeing that, as you say "accidents happen all the time". I'm not knocking what you've done here but don't want folks thinking it's the norm thing to do by default unless they're willing to take the risks involved as does custom cooling. Better everyone who want lower temperatures to invest in Hybrid Kit than to experiment with Liquid Metal. Temperatures best than any triple fan card and all heat go out of case, that's everything what gamers need. I used LM with the hybrid, there no difference in reasoning whether you're using air or water: you want the best thermal transfer between materials. Oddly enough I've found LM to be 'easier' work with as far as getting a good consistent layer, though it does take more time to work a perfect even layer. The main issue with LM is excess. You only need just enough so there is a thin even shiny layer across both the IHS and the cooler heatsink with no pooling at all. If you have pooling, you're using too much. Exactly, the number of GPU's killed by their own Hybrid versus? I'm sure someone has blown one up, but it's no riskier than installing a Hybrid that works, never mind one from EVGA. I might try this on the GPU if I ever need to remove the card (water loop) for whatever reason just for fun. So black duct tape around the die is safe? I have a new roll I bought 2 months ago. Heh.. expensive strong stuff. The 2080ti ftw3 card is around 38-39c on load with the hydro copper block.. prob drop to under 34c I'm guessing. Get the liquid tape. Any sort of material tape, such as electrical tape that is non conformal, is almost pointless. The issue with LM is that it will wick under tape at the edge. So if you're going to bother, you need a impermeable seal around the edge of the die area where if any LM weeps out, it will not just flow right under it. 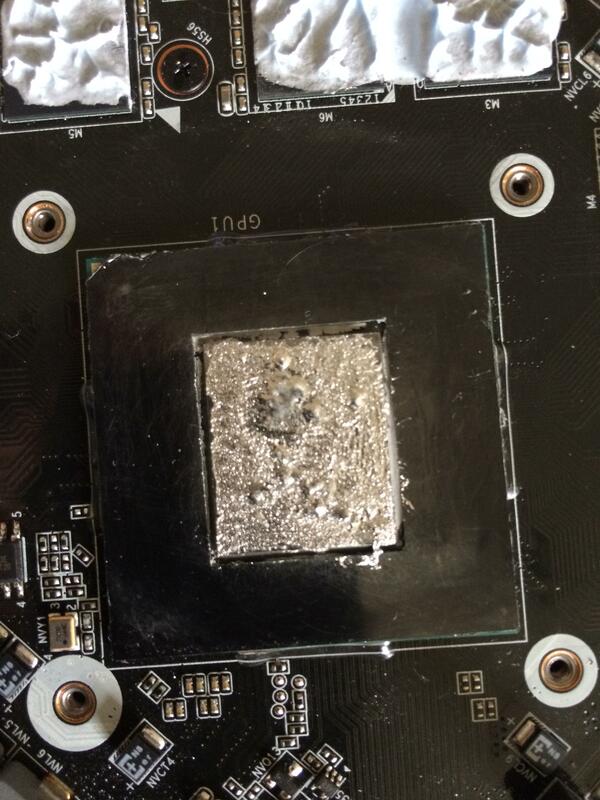 Before you try make sure that your GPU block is not made of aluminum, as it reacts with LM. Most today's gpu waterblocks are made of nickel plated copper which is perfectly fine. The most important thing when using LM is to use the right quantity to avoid any leak from the gpu die. So you apply only the utmost minimum possible amount of LM on the die to begin with (the tiniest drop of LM you can get from the syringe) then you spread it as much as you can to cover all the gpu's die. The goal is to have the minimum LM used to cover the whole die. Then once all the die is covered, add a very small drop of LM in the center of the die that will ensure there is enough LM everywhere to get a good contact with the block. If you do this there is no way LM will leak outside the GPU die because there are not enough quantity of LM for leaking to happen. But to add extra safety you can indeed use any non conductive isolating material like black duck tape. Just make sure that it doesn't react to LM before using it and use it the closest as possible to the gpu die so if some get spilled, it wont get below the tape. I personally hand cut black tape so it would fit perfectly between the gpu die and the gpu frame so it doesn't add a layer of thickness that could mess with the waterblock fitting (as you can see in my above pictures). Liquid tape sounds like a permanent deal which I won't want. I want it all stock and perfect when it's time for resale. Awesome post! Wish I would of seen that before I did my CPU! Great tips. It peels right off. Why do you believe I would advise you to use something that might void your warrant. I'm out. sheesh. The quantity of liquid metal applied, in the pic above, seems to be a bit too much. From all the videos I've seen, all it takes is a very thin layer, without any bubbles. Wow, this thread started June 26 2017!! !